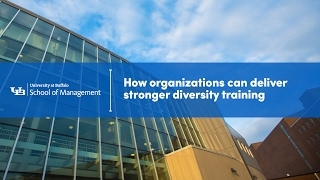 BUFFALO, N.Y. — While diversity training programs are a good way to build awareness of cultural differences, they usually are not as effective at changing attitudes and behaviors toward diverse groups in the workplace, according to new research from the University at Buffalo School of Management. Published in Psychological Bulletin, the study found diversity training can be successful — but that results vary widely based on the content and length of training and whether it was accompanied by other related initiatives. Diversity training aims to enhance participants’ cultural awareness, skills and motivation to interact with individuals of different ethnicities, genders, orientations, ages and more. Bezrukova and her team examined more than 40 years of research, combining data from 260 studies and more than 29,000 participants across a variety of fields. They found diversity training had immediate positive effects on participants’ knowledge, attitudes and behaviors related to diverse groups. Over time, however, their attitude and behavioral changes decayed or reverted, while their cultural knowledge remained consistent or even increased. The study found training is most effective when it is mandatory, delivered over an extended period of time, integrated with other initiatives and designed to increase both awareness and skills. In addition, participants responded more favorably to programs that used several methods of instruction, including lectures, discussions and exercises. Bezrukova’s co-authors on the study are Karen Jehn, PhD, professor of management, University of Melbourne Business School; Jamie Perry, PhD, assistant professor, Cornell University School of Hotel Administration; and Chester Spell, PhD, professor of management, Rutgers University School of Business-Camden.